Stamps to the Rescue! Ellen, USPS Help Shelter Animals. I love the new stamp campaign by the United States Postal Service. Wait, did I just say that? Weird. But I do! The new stamp campaign is called Stamps to the Rescue. 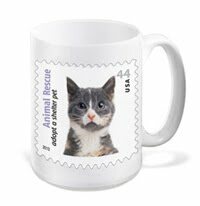 The goal of these special edition stamps is to raise awareness of shelter animals in need. Fact: Nearly half of the animals that enter animal shelters are euthanized. "In celebration of the new Animal Rescue: Adopt a Shelter Pet stamps, the Postal Service™, together with Ellen DeGeneres and Halo: Purely for Pets, is giving shelter pets around the country a First-Class Meal. During the launch of the stamps, Halo will be donating a million meals to animal shelters around the country." 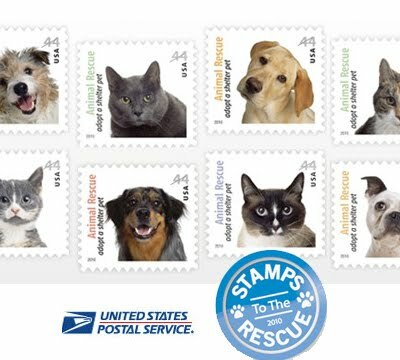 The Stamps to the Rescue Goal: "We want more Americans to know about the millions of shelter pets that need good homes. Nearly half of the animals that enter animal shelters are euthanized. Many of these cats and dogs would have made a wonderful pet...if only given the chance.You can make a difference. 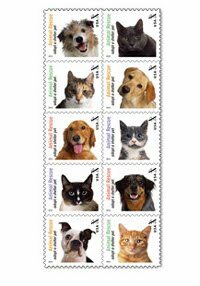 Adopt a pet, volunteer at a shelter, or just get the word out by buying these stamps." You can pre-order stamps online now. You can even buy mugs, coasters and other stamp artwork to benefit this furry-fantastic cause. See the awesome campaign website "Stamps to the Rescue" and learn more about the campaign. The site even features an Adoption 101 section.